Robots the size of a human blood cell could monitor everything from human bodies to oil pipelines. But first they've got to get built. 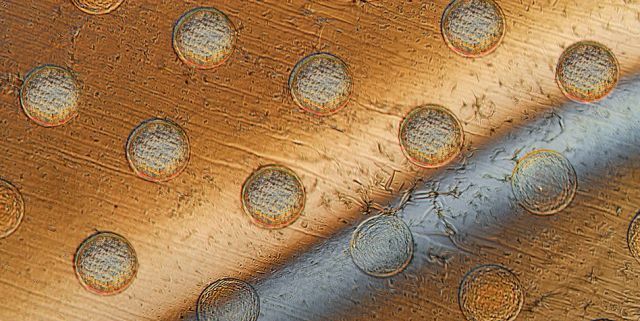 A team from MIT has developed a new model for building microscopic robots, a system they're calling "autoperforation." The system uses a type of carbon called graphene, a super strong material that contains a single layer of atoms. Graphene is heavily hyped these days, but the MIT researchers were able to exploit an unusual quality: Its brittle nature. Like a wafer or an egg, graphene can shatter easily. "We discovered that you can use the brittleness," says MIT Professor Michael Strano in a press statement. "It's counterintuitive. Before this work, if you told me you could fracture a material to control its shape at the nanoscale, I would have been incredulous." It works like this: A layer of graphene is placed over an array of polymer dots, tiny semiconductors. As the graphene drapes over the round edges of the dots, lines of strain begin to emerge. "Imagine a tablecloth falling slowly down onto the surface of a circular table," says grad student Albert Liu, who worked with Strano on the project. "One can very easily visualize the developing circular strain toward the table edges, and that's very much analogous to what happens when a flat sheet of graphene folds around these printed polymer pillars." When this folding pattern kicks in, Strano says, "something pretty amazing happens: The graphene will completely fracture, but the fracture will be guided around the periphery of the pillar." The end of the process left the steam with a neat and tidy piece of graphene that looked like the result of a hole punch, seen in the picture above. The idea of cell-like robots, which Strano and Liu call "syncells," (synthetic cells), is that they would "start to look and behave like a living biological cell. In fact, under a microscope, you could probably convince most people that it is a cell," Strano says. Strano imagines syncells being used as a means of biomedical testing. Inject hundreds into the bloodstreams and let the data fly back into sensors. Previously, work on syncells required them to be built one at a time, but the new method of construction will allow for mass production. Strano, who wrote the letters "M," "I," and "T" into a new mass-produced syncell to prove their effectiveness, sees the new method as a gamechanger.